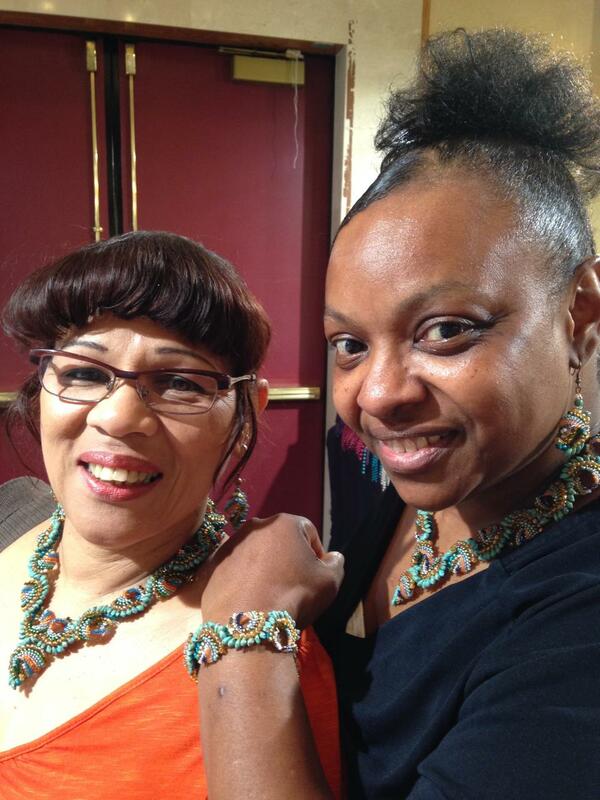 Mildred and Phyllis met at the February 2015 Innovative Bead Expo in Fishkill, NY. They returned this weekend to celebrate their 6-month anniversary wearing the Swirls & Twirls set that they beaded together. They have become great beading buddies due to their love for beading, which brings them together on Saturday�s to work on projects that they like, including the set they are adorning in the picture. Mildred, who saw the picture in the April 2015 Bead and Button magazine, is the inspiration behind their twin-like necklace and earrings sets. She showed Phyllis the picture and stated her intention to make the set but Phyllis was not initially interested. However, she accompanied Mildred to a subsequent bead show where Mildred purchased the beads she needed to make the set. Phyllis purchased the beads she needed for a different project from the same magazine. A couple of weeks later, Phyllis told Mildred that she now wanted to make the set and they planned to wear them to this summer�s show. They were impressed by the amount of attention and compliments they drew over the weekend from vendors and other customers who admired the sets and were able to see the unique differences in each set. Mildred's set has more of a matte look. And Phyllis' set has a softer look. The ladies shared a celebratory lunch at Cracker Barrel after Saturday�s show. They have now been bestowed the new title of BBFF � Beading Best Friends Forever!